New expanded text ads came out as part of Google’s latest changes in summer 2016 and will replace the old text format by January 31, 2017. The new ad format has given advertisers another 35 characters to display their offer in the headline and has increased the description from two lines of 35 characters to one line of 80 characters, giving advertisers more space to display their features, benefits and calls to action. But what does all of this mean for advertisers? From early tests WordStream has noticed that the clickthrough rate (CTR) has increase by around 20%. This is something that we have also noticed within our own split tests at Clicteq. Here is the side-by-side comparison of performance of the old format text ads vs. the new expanded advert format. Here is the analysis of our data for one account, looking at around £50,000 in advertising spend and 443,000 impressions across several thousand keywords. From the table above you will be able to see that the old advert format had a CTR of 3.23% compared to the new expanded text ad format that had a CTR of 4.09%. 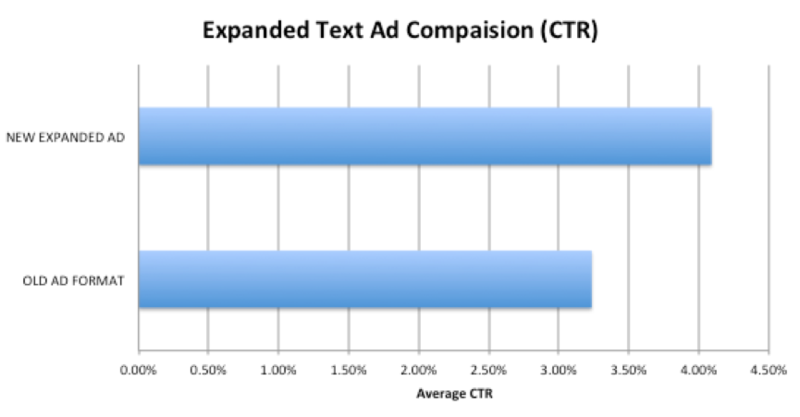 This equates to an increase in CTR of 21.02% on the new expanded text ads, although it is difficult to do a direct side-by-side comparison as we have to change the ad copy to fill out the extra space in the new ads. We think the main reason for the increase in CTR is due to the fact that ads are now occupying more real estate on the first page of Google. Though we believe that this increase in CTR may be short-lived as a large number of advertisers that were competing with this advert were using the old standard text ads. This gave us a significant advantage and we think that as all advertisers transition towards this new ad format that there will still be some increase in CTR but it will not be as drastic as it was when the new format was launched. 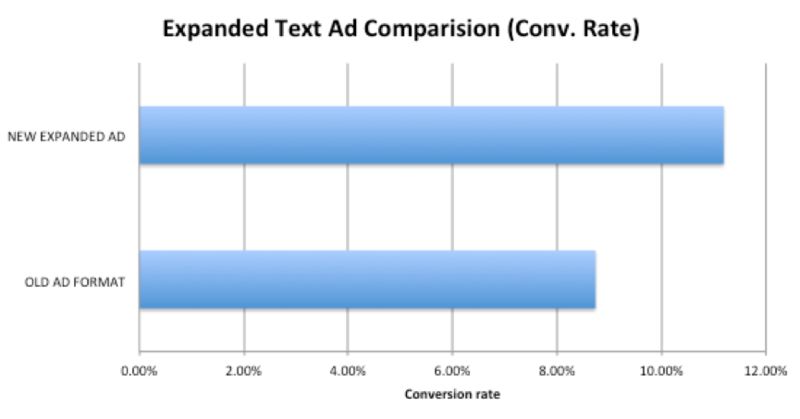 Surprisingly we have also seen an increase in conversion rate when we implemented the expanded text ads. We saw the conversion rate was 11.19% on the new expanded format compare to just 8.73% on the old standard ad format, which equated to an increase of 21.9%. We believe that there could be two possible reasons for the unexpected increase in conversion rate. This may be due to the fact that we are able to be more descriptive of the offer within the ad and therefore people are better prepared for what they see on the landing page and therefore convert better. Or it may be because we are able to add more features and benefits to the advert, which may make it more enticing and increase the number of people that convert. One of the downsides of Google bringing out the new expanded ad format is that PPC account managers must migrate all of their old text adverts to the new expanded ad format. This is not to big a problem when you are working with smaller accounts, however when you are working with accounts with 10K-100K+ adverts this can become a seriously big task that needs to be completed before Google’s deadline. A simple way that you can make this task slightly less painful is by using an Adwords script to do some of the repetitive work for you. One of the best scripts that I’ve come across for this is written by Frederick Vallaeys, called simply “A free script for Expanded text ads”. This free tool allows you to scrape your organic listings and use some of this information to build your next expanded text ads if you are struggling to get them all switched over in time. The meta title gets split into two and then becomes the headline one and headline two of the advert, and the first 80 characters of the meta description then become the advert description. In all it is clear that from upgrading your standard AdWords text ads to the next expanded ad format there are strong CTR and conversion rate benefits to be had. The studies by ourselves and WordStream both showed a healthy 20%+ increase in CTR. However with any upgrade to AdWords there is always going to be a significant amount of work involved, especially considering that this is probably Google’s biggest ever single update. So make use of tools such as AdWords editor, Excel and AdWords scripts to make your life easier and automate tasks wherever possible. We might be free falling into Autumn, but if there’s one thing that can make darker mornings and shorter days slightly more bearable – it’s some juicy digital marketing stats. This week’s roundup includes news on video ads, attribution, consumer behaviour and lots more.